Mrs. Winifred Ann Cates Snider, 84, of Liberty passed away on Wednesday, June 21, 2017 at Clapp's Assisted Living in Pleasant Garden. 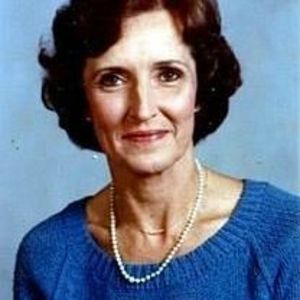 Mrs. Snider taught English and Reading for 30 years in the Davidson and Randolph County School Systems. She was a member of Alpha Delta Kappa Educational Sorority and received a Bachelor of Arts Degree from Women's College (UNCG). She enjoyed playing Bridge, traveling and going to horse shows. She was a loving, wife, mother and grandmother who lived life with a courageous spirit. A funeral service will be held on Saturday, June 24, 2017 at 11:00 a.m. at First United Methodist Church in Liberty, officiated by Rev. Eugene Dean and Rev. Sam Lewis; burial will follow in Fairview Cemetery. The family will receive friends on Saturday from 10:00-10:45 a.m. in the church fellowship hall, prior to the service. She was the daughter of the late James Monroe Cates, Jr. and Frances Nowlin Cates and was also preceded in death by her husband of 58 years, Harold Jones Snider. Surviving is her daughter, Melinda Cole (Rich) of Summerfield; son, Mark Snider (Teressa) of Greensboro; sister, Jackie Cates Smith of Ramseur; grandchildren, Alex, Aaron, Andrew, and Addison Snider, Kate and Sarah Cole; and great-grandchildren, Paisley, Smith, Stella and Oliver Snider. In lieu of flowers, memorial contributions may be made to First United Methodist Church of Liberty, PO Box 220, Liberty, NC 27298 or Hospice and Palliative Care of Greensboro, 2500 Summit Avenue, Greensboro, NC 27405.